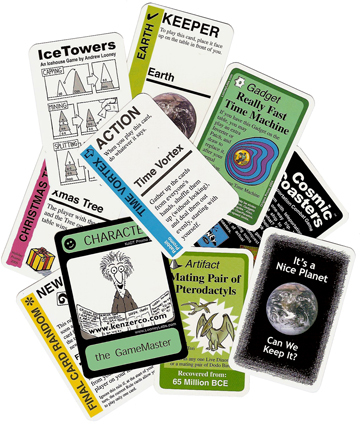 Every year, since we first debuted Fluxx at Origins in 1997, we have been making Promo Cards, to give away at conventions to attract interest in our games. This is a complete index to all the bonus cards we have ever created... those that are available for sale are split between Promo Cards (cards that can be added into our games), Literature Cards (cards with rules/info about our games), and Specialty Cards (other special topic cards). Some of these cards are available in 25 packs... for our Rabbits to distribute at conventions, or store owners to give away in their stores. Only those cards which we have large quantities of are available in these packs. In June 2006, we discontinued our former SASE program, when we found that we were almost 8 months behind in processing requests. Now anyone can get our old promo cards - and we can mail them anywhere in the world without anyone having to try to find US stamps for their Self Addressed Stamped Envelopes. It's a wonderful thing. Please don't send in SASE requests - all the cards are now over at our warehouse! Please order the cards you want from the various options in our Literature Rack. Some of the old packages of promo cards are also still available in old formats in our store called the Dangling Carrot. Thanks for playing our games and collecting our promo cards!